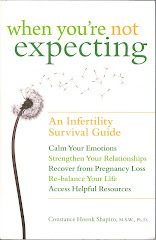 Many of us find our struggles with infertility are especially difficult during the winter holidays. Perhaps our medical specialists have curtailed their office hours; perhaps we are overwhelmed at the mall with the numbers of children sitting on Santa's lap or the number of parents pushing strollers; perhaps last year we had looked forward to being pregnant by this holiday season, and we're not; and very likely it is hard to get excited about holiday gifts and celebrations when the only rejoicing we could imagine would be to revel in a positive pregnancy test or having our own baby to cuddle under the holiday lights. So with this acute awareness that the holiday lights seem dimmer this year, I'd like to offer some thoughts on ways that you can turn up the wattage. Of course, being infertile does not make you the only person feeling some disappointment in the holiday hecticness. We all tend to have inflated expectations of family togetherness and spreading joy at this time of the year. But infertility does present itself as a reminder of reproductive sadness to couples, and it also is an unresolved issue that keeps tugging at your heartstrings. So how can you get beyond this emotional disappointment at a time of the year when others seem so effortlessly to be celebrating the joys of the season? Perhaps one thing to consider is to decide with your partner how you want to acknowledge the holidays this year. Would you like to host a party or to go to lots of holiday gatherings? Would it be soothing to spend some peaceful time together before the fireplace or hiking outdoors? Would it bring you satisfaction to do some volunteer work in health care facilities or soup kitchens where regular staff would appreciate having time off during the holiday season? Do you enjoy baking holiday goodies to share with friends and family? If the local shopping scene is stressful, might you consider home made gifts or ordering from catalogues instead of braving the crowds? Rather than getting swept up in the hectic pre-holiday rush, think purposefully about what will bring you pleasure among the many choices available and then indulge yourself in these activities. Another aspect of the holidays to consider is which rituals have meaning for you. You may decide that you no longer want to participate in familiar family rituals, like watching nieces and nephews open their presents, if this now feels more obligatory than joyful. Now is the time to absent yourself from rituals that no longer are satisfying and to invent or participate in new rituals that are more uplifting. How about a midnight walk in the snow, or a nighttime stroll to enjoy the holiday lights, or a peaceful cup of eggnog before a crackling fire? Or maybe a try at ice skating after many years off the rink or a visit to a local nursing home or watching some favorite DVDs with loved ones? There's nothing magical about inventing rituals -- just an opportunity to let your imagination travel in creative directions! So what if your family objects that your new holiday rituals prevent you from participating in their favorite familiar ones? Every family is different, and you know best how to counter their objections, but keep in mind that you have every right to assert your belief that change can be good, new rituals will bring you happiness, and you would appreciate family support as you move forward in seeking happiness during the holidays. Since we're in the midst of the holiday season, now is a good time to rethink what can make this time of year more uplifting for you. Let your imagination soar, let your creativity flow, and get in a holiday spirit that offers a chance for your infertility to co-exist with love, with embracing unique rituals, and with discovering new aspects of yourself as you move forward into the new year!